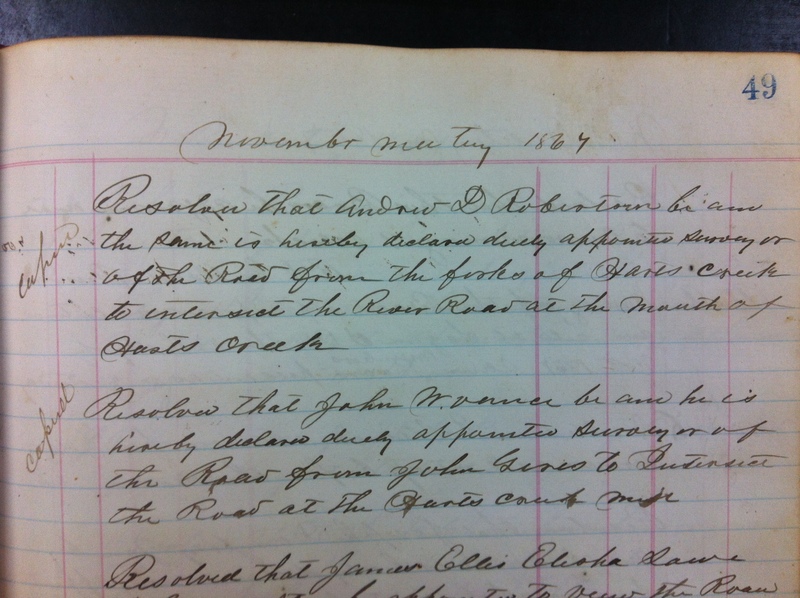 Andrew D. Robinson is appointed road supervisor, November 1867 (p. 49). Commissioners Record Book 1, Logan County Clerk’s Office, Logan, WV. Big Harts Creek, located in Harts Creek District of Lincoln County, West Virginia, and Chapmanville District of Logan County, West Virginia, has hosted seven post offices: Hearts Creek/Hart’s Creek/Hart/Harts (1870-present), Warren (1884-1894), Spottswood (1901-1908), Halcyon (1906-1923), Whirlwind (1910-1950s), Enzelo (1916-1922), and Shively (1926-?). Today, one post office exists at the mouth of Harts Creek in the town of Harts. NOTE: For more information regarding the Whirlwind PO, see other posts at this blog. 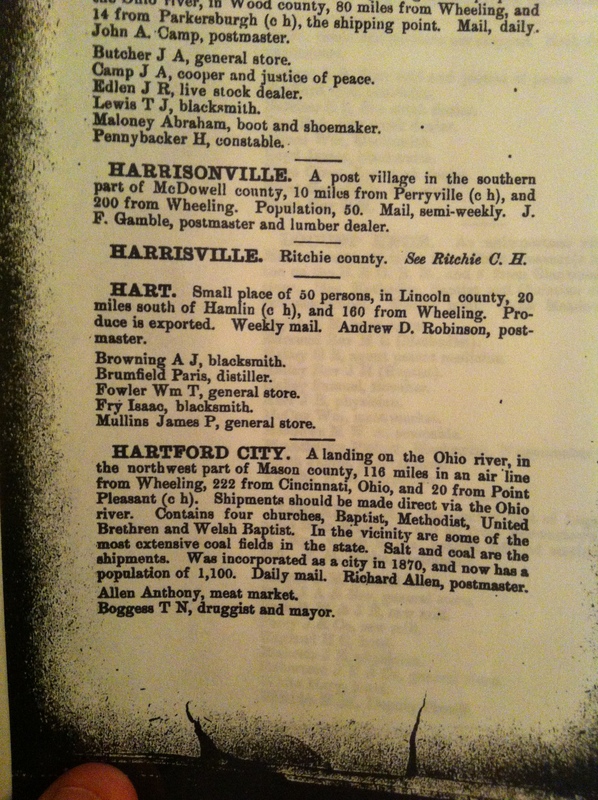 “Hart,” Polk’s West Virginia State Gazetteer and Business Directory, 1882-1883. A few weeks later, Brandon called Nellie Thompson in Wayne, West Virginia. Nellie reportedly had the picture of Milt Haley and Green McCoy. Almost hyperventilating, he asked her to read it over the telephone. Nellie fetched it from somewhere in the house, said it was dated May 19, 1889, then read it to him and said he was welcome to see it. A few days later, Brandon drove to see Nellie about the picture and letter. Before dropping in on her, he spent a little time at the local library where he located a story about Spicie McCoy. After a short time, Brandon drove to Nellie’s home, where she produced a small tin picture of two men sitting together. One of the men was obviously Green McCoy based on the picture we had already seen of him. The other fellow, then, was Milt. As Brandon stared at the tintype, Nellie handed him Green’s letter. It was penned in a surprisingly nice handwriting, addressed to his brother Harrison, and was apparently never mailed. At the time of his writing, it was spring and McCoy had just moved back to Harts — probably after a short stay with his family or in-laws in Wayne County. He may’ve been there with his older brother, John, who’d married a girl almost half his age from Wayne County earlier in February. Dear Brother. after a long delay of time I take this opertunity of droping you a few lines to let you know that I am well hoping when these lines reaches you they may find you all the same. Harrison you must excuse me for not writing sooner. the cause of me not writing is this[:] the post master here is very careless. they let people brake open the letters and read them so I will write this time to let you know where I am and where Lynza is. I have moved back to the west fork of Harts Creek and Lynza is married and living in wayne co yet on beach fork. everybody is done planting corn very near in this country. every thing looks lively in this part. tell Father and mother that I[‘m] coming out this fall after crops are laid by if I live and Lynza will come with me. tell all howdy for me. you may look for us boath. if death nor sickness don’t tak[e] place we will come. Harrison I would rather you would not write anymore this summer. people brakes open the letters and reads them so I will not write a long letter. Brumfield and me lives in 2 miles of each other and has had no more trubble but every body says that he will kill me if I don’t kill him. I look to have trouble with him so I will close this time. Clutching carefully onto the tintype and letter, Brandon asked Nellie what she’d heard about Milt and Green’s death. She didn’t really know much, but her brother Goble Richardson said he’d always heard that pack-peddlers who boarded with Paris Brumfield never left his home alive. These men were supposedly killed, tied to rocks, and thrown to the bottom of the Guyan River where the fish ate their rotting corpses. Soon after the “disappearance” of these pack-peddlers, Paris would be seen riding the man’s horse, while his children would be playing with his merchandise. When Brandon arrived home he studied over Green McCoy’s letter — all the cursive strokes, the occasional misspellings, trying to extract something from it beyond what it plainly read. Strangely, the letter didn’t reveal to which Brumfield — Al or Paris — Green referred when he wrote, “every body says that he will kill me if I don’t kill him.” It seems likely, though, based on what Daisy Ross had said, that Green referenced Paris. Still, it was Al Brumfield who was ambushed only three months later. At the time of the Haley-McCoy trouble, Harts had two post offices: Harts and Warren. The postmaster at Harts — where McCoy likely received his mail — was Ross Fowler, son to the Bill Fowler who was eventually driven away from Harts by the Brumfields. Ross, though, was close with the Brumfields and even ferried the 1889 posse across the river to Green Shoal with Milt and Green as prisoners (according to Bob Dingess) in October of 1889. A little later, he worked in Al Brumfield’s store. The postmaster at Warren was Andrew D. Robinson, a former justice of the peace and brother-in-law to Ben Adams and Sallie Dingess. Robinson seems to have been a man of good credit who stayed neutral in the trouble.